On Sunday we held our third and final 2013 Science and Food public lecture: The Science of Pie. Renowned pastry chef Christina Tosi joined us all the way from New York to explain her process for creating new desserts, and Los Angeles native and super-star baker Zoe Nathan shared her tips for baking the perfect apple pie. Guests indulged in delicious goodies from Zoe Nathan’s Huckleberry Café, Compost Cookies from Momofuku Milk Bar, and espresso brewed by four talented baristas. 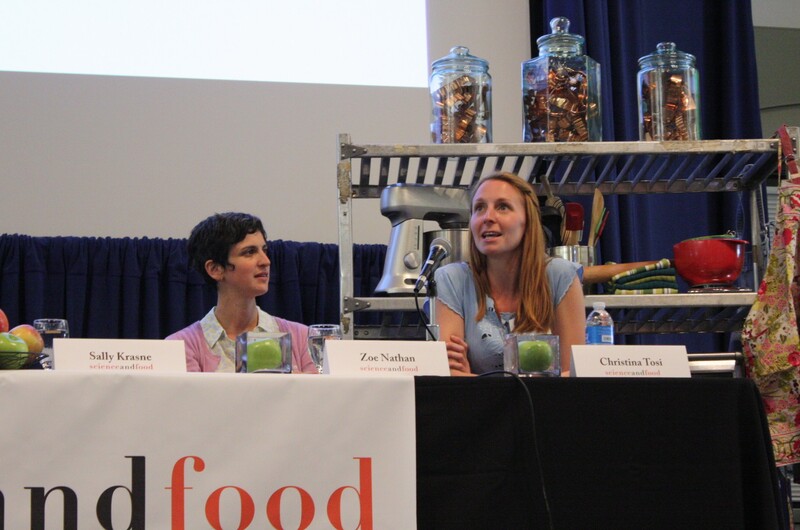 Zoe Nathan and Christina Tosi answer questions from the audience after their lectures. And, of course, there was pie. For weeks, students from the UCLA Science and Food course have been studying the apple pie and using scientific inquiry and experimentation to try to create the “ultimate” apple pie experience. Students examined everything from how different apple varieties behave in pie filling to how the size and shape of the pie affects baking. Several students also played with unconventional ingredients, including avocado oil, yogurt, chia seeds, and whiskey. Students prepare their apple pies the morning of the event. Students share their research projects and apple pies with the public. 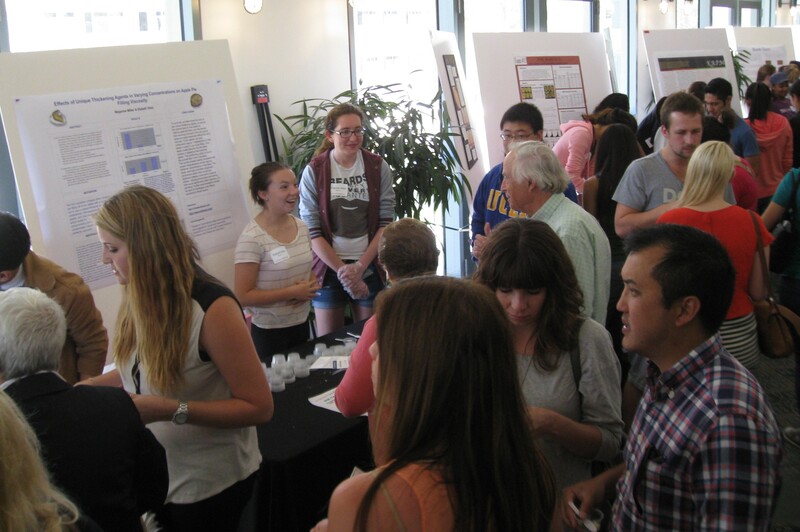 The students presented their research projects and pies at Sunday’s event. While the public enjoyed sampling the scientific treats, the pies were scrutinized by an esteemed panel of judges made up of chefs (Christina Tosi and Zoe Nathan), food critics (Evan Kleiman and Jonathan Gold), and scientists (UCLA Professors Andrea Kasko and Sally Krasne). After tasting the pies a talking with the students, the public voted for their favorite pie and the judges settled on three additional stand-outs. The lucky winners all took home wonderful prizes from our friends at Breville. Apple pie with shortbread crust and streusel topping. This solo effort explored the vast parameter space of pie, studying the effect of fat content and temperature on the texture of the shortbread crust, as well as the effect of pH on the browning of the streusel topping. The final winning pie had shortbread made with room temperature standard American butter. Deconstructed apple pie with pie crust crumbs and spherified apples. Using the technique of spherification, this team applied their knowledge of diffusion and gelation to prepare “reconstituted” apples. They found that optimizing both the calcium chloride concentration and gelation time was key to making a delicious modernist apple pie. Pie crust made with different liquids, including vodka, beer, and sparkling water. Seeking to perfect pie crust texture, team Aπ3 experimented with different liquids that may impede the formation of gluten protein networks. Gluten gives structure and stability to pie dough, but can also make pie dough dense and tough when over-developed. The team examined the porousness, density, and browning of pie crusts prepared with three different liquids compared to water and concluded that vodka creates the flakiest pie crust. Frozen apple pie with peanut butter mousse. This student duo thought outside the box with this creative apple and peanut butter pie. To create the ultimate peanut butter experience, the team experimented with the effect of egg white content on the texture and density of the peanut butter mousse. The Science of Pie was the perfect end to a fantastic lecture series. We are so grateful to our amazing lecturers and all the people and sponsors who made the lectures possible. And although the 2014 lectures might seem impossibly far away, don’t worry—the Science & Food blog is not going anywhere! Keep an eye on out for more exciting food science posts, profiles, recipes, and maybe even a few videos through the rest of the year. Tags: apple pie, apples, baking, christina tosi, Evan Kleiman, jonathan gold, pie, pie crust, science, zoe nathan. Bookmark the permalink. How about sharing some of these prize winning recipes!!! Working on it! We are planning to post recipes and more information about the research projects in the coming months. Hopefully it will be worth the wait!